Druzilla V. Sanders returned to be with The Lord on December 1st, 2018 at the age of 96. She was a loving Wife, Mother, Grandmother and Friend, who will be greatly missed by everyone. She loved Jesus with all her heart and spent all of her days serving and praising Him. Druzilla was born on June 7th, 1922 in Seneca, South Carolina. 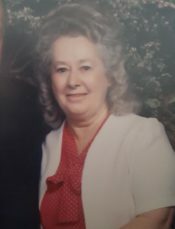 She was a long-time resident of Pensacola, Florida and an active member and Sunday School Teacher at Pensacola Deliverance Temple for many years. She was preceded in death by her Mother Kallie Kirby, her Father Richard Kirby, her Husband Julius Sanders, her Sister Helen Moore, her 5 Brothers Sheilor Kirby, Astor Kirby, Woodrow Kirby, Chris Kirby and Carnell Kirby, her Granddaughter Tami Mears and her Daughter in Law Audrey Sanders. She is survived by her Brother Hunter Kirby, her Sister Margaret Black, her children Gary Sanders (Rebecca), Michael Sanders, Larry Sanders and Patricia Nelson (Carl Eugene), her 7 Grandchildren Terra Sanders, Gary Nick Sanders, Tracy Hayes (Scott), Tania Nelson and Tonya Leavins (Aaron), her 13 Great Grandchildren Tia Frye, Toriee Nielsen, Christian Nielsen, Brooke Gibson, Felicia Mears, Jeremy Mears, Dakota Hayes, Seth Hayes, Dylan Hayes, Christina Leavins, David Leavins, Tyler Gaddis and Justin Gaddis, 6 Great-Great Grandchildren, several nieces and nephews, as well as her very special long-time friend Dianne Capers. A Visitation will Be held at Pensacola Memorial Gardens on Monday December 10th at 10:00 AM with a Service to follow at 11:00 AM.